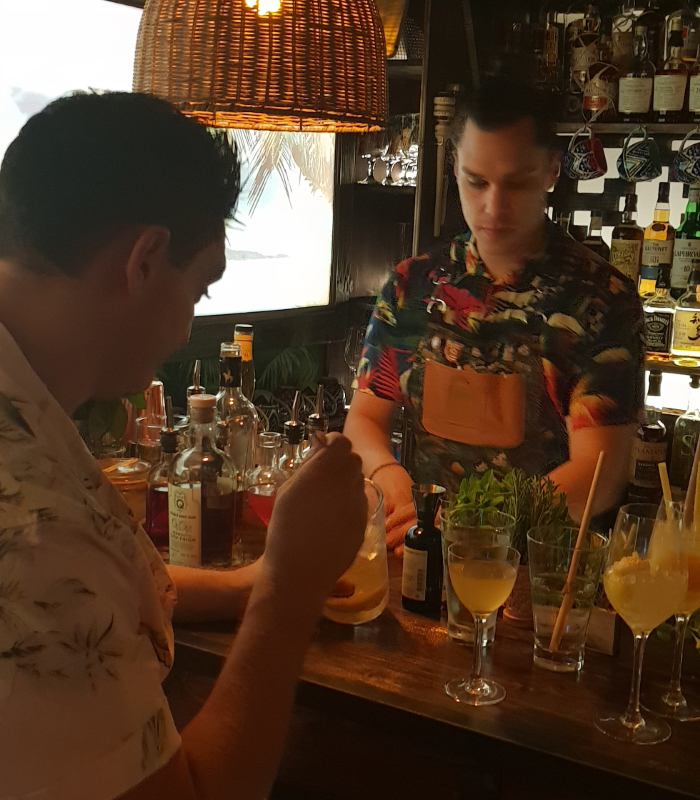 Yes, we really did leave it this late after its opening to make our first trip to Laki Kane, the new tropical tiki bar care of Georgi Radev, Steve Kyprianou, and Sam Robson. The bar is on the restaurant- and bar-heavy Upper Street in Islington and is a strong offering to this popular location. First impressions are that the decoration is finely thought-through, from the drum tables, tropical wallpaper and window mural that reveals itself at night, and is complemented by the friendly hosting, welcome drink and nibbles and tables named after islands in the Caribbean and South Pacific. The Fiji table is where we were seated on the night. 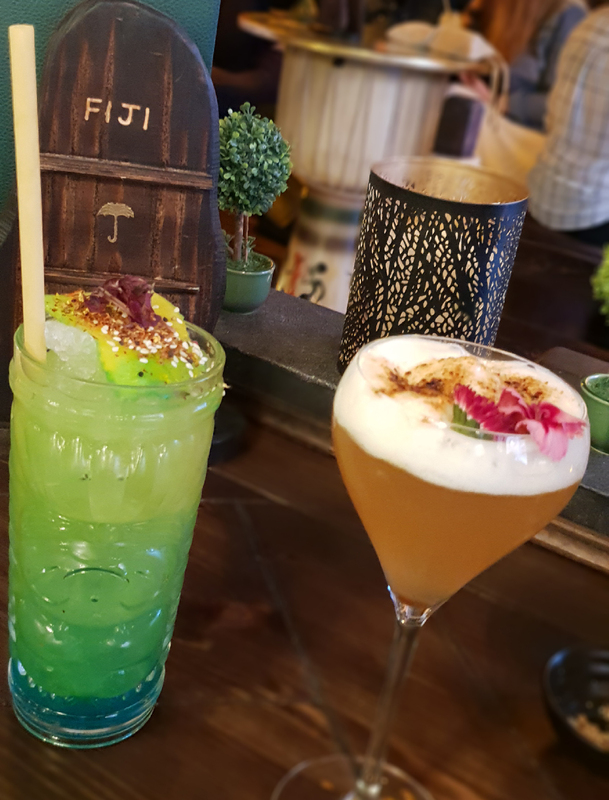 Good looks and ambience aside, what we were really there for was the drinks, promising exotic flavours and no artificial or refined sugars and a strong rum bias. 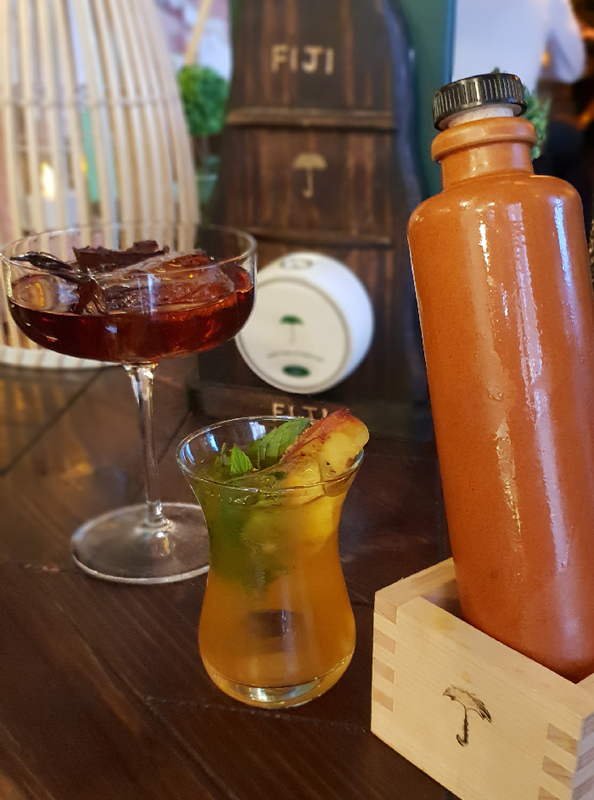 Message in a bottle: Rum Bar Gold and HSE white with saffron gin, oleo saccharum (citrus oil sugar), lemon juice and rooibos tea. Laki Lambo: HSE élevé sous bois, Hennessy VSOP cognac, Cointreau Blood Orange, osmanthus syrup and fresh lemon juice. Topped with pineapple foam and caramelised with coconut sugar which was thick and smooth like Italian meringue. Mahi mahi: Rum Bar Overproof and Mount Gay Black Barrel, with mango puree, tangerine sherbet, fresh lime and a touch of Blue Curacao. Rums came through and refreshing like fresh sugar cane juice. 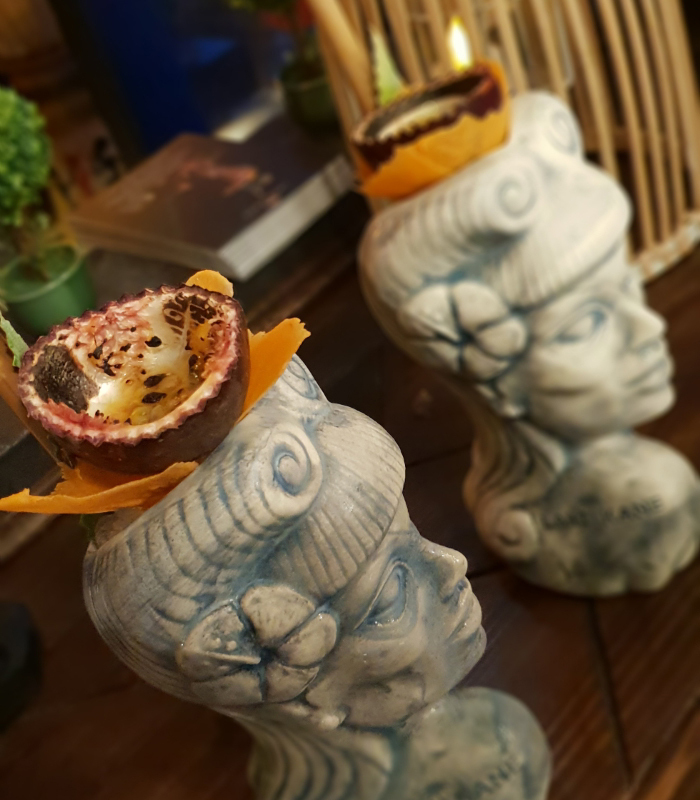 Two Pin-Up Zombies: A powerful and full-flavoured combo of Bacardi Añejo Cuatro, Santa Teresa 1796 and Pusser’s Gunpowder rums, shaken with cherry and mountain pine liqueurs, exotic syrups, falernum liqueur and citrus. 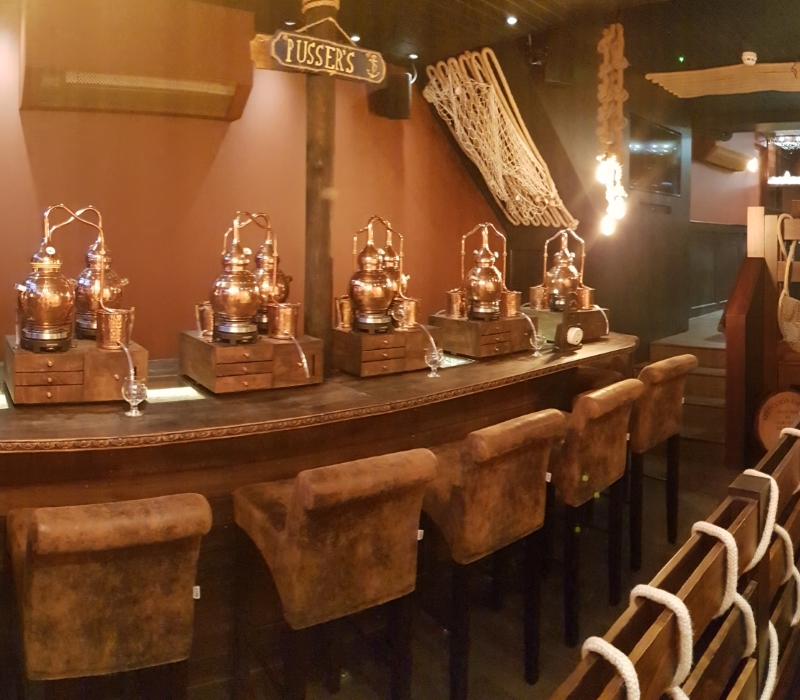 We also had a quick peek upstairs at the Spiced Dry Rum Club set-up, with around 20 mini pot stills. It will host half-day masterclasses culminating in attendees re-distilling rum (from the Bimber distillery) with their own combination of spices to take home. Definitely something we’ll be suggesting as extra-curricular trips for our day jobs! Full details here, with booking opening soon. It was good to catch-up with Georgi and Timmy, and seeing some familiar faces on the night. Great drinks, lovely people, great service and super cool bar, definitely a bar to visit! 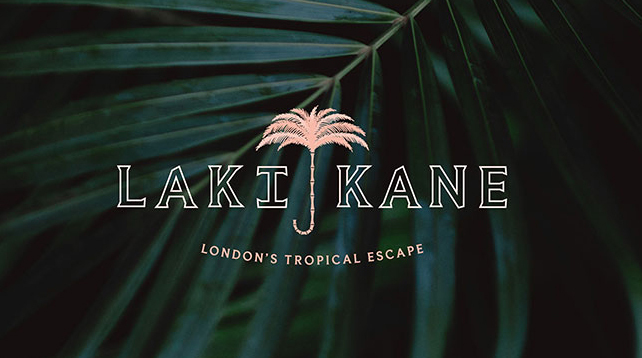 We are looking forward to visiting Laki Kane again very soon, and hoping to have a go at distilling our own spiced rum at some point, maybe a Christmas present? Next Rumming has launched Lakaz Rom, the UK’s first rum search and price comparison website!